I just got a new car. The old one got me through so many weather jams I am grateful for the 11 years it gave me. 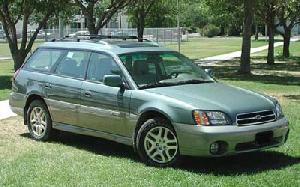 That old green 2003 Outback will be missed. No car payments will be missed. You know what will not be missed? Headlights going out when the emergency brake light goes on while driving down the interstate. Not having any dash lights and having to see the speedometer while going under a street light or following (a safe distance) behind someone else. Front end grinding and knocking. Knocked out front fog light from when Emily scraped a parked car. Hole in back bumper when I drove over a generator. A “My Child is an Honor Student” in middle school bumper sticker (oh, yes I was one of those parents). Since Tristan was 14, I’ve been trying to get it off. Goo Be Gone and then finally a chisel. Tristan is now 18 and still no dice. The poor old green thing has been replaced by a dark grey 2015 Outback. Unfortunately, the new car smell has been replaced by Chick-Fil-A, Starbucks and poodle.